Ruby Nile Games has a Kickstarter campaign going for Darkraven Science Fiction Soundscapes. Most of these I've seen are Fantasy. Here's a sci-fi one for your sci-fi game players. 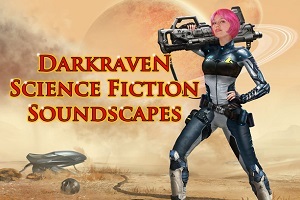 Darkraven Science Fiction Soundscapes. 36+ handcrafted tracks with over 9 hours of sound for your science fiction and cyberpunk games.